We have FINE and RARE PROFESSIONAL violas made by craftsmen like Guadagnini, Testore and modern Italian makers available here regularly. 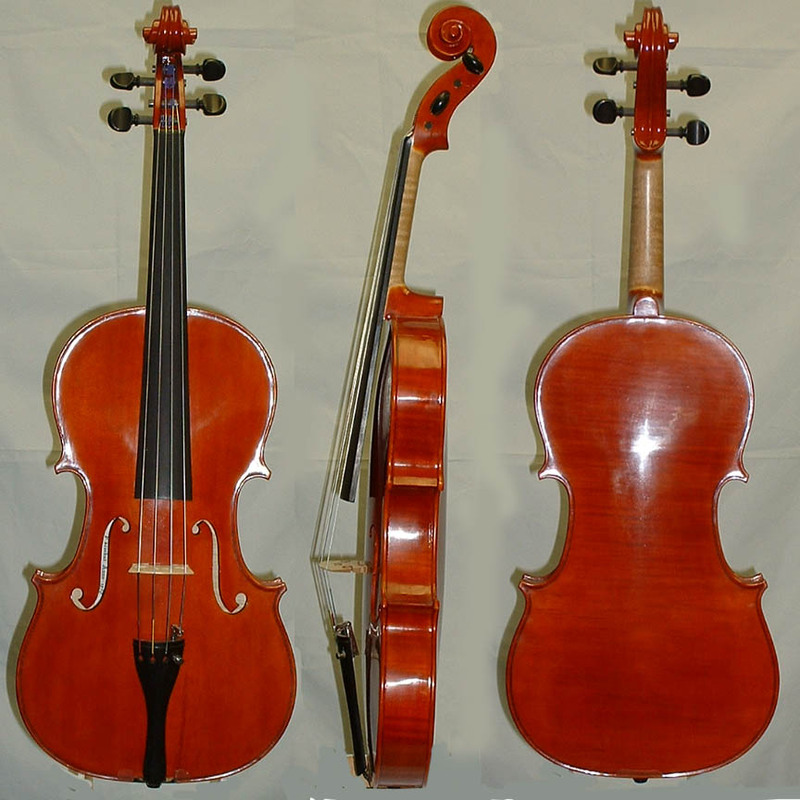 Please inquire if you have a specific request for an old master instrument or bow. Listed below are many of the fine violas we currently have in stock. Leopold Widhalm and son. Nurnberg, Germany 1783. Leopold Widhalm and son. Nurnberg, Germany 1783. Roland Gentle 1983 viola 16 9/16"
Fine viola made by Roland Gentle of Cambridge England. 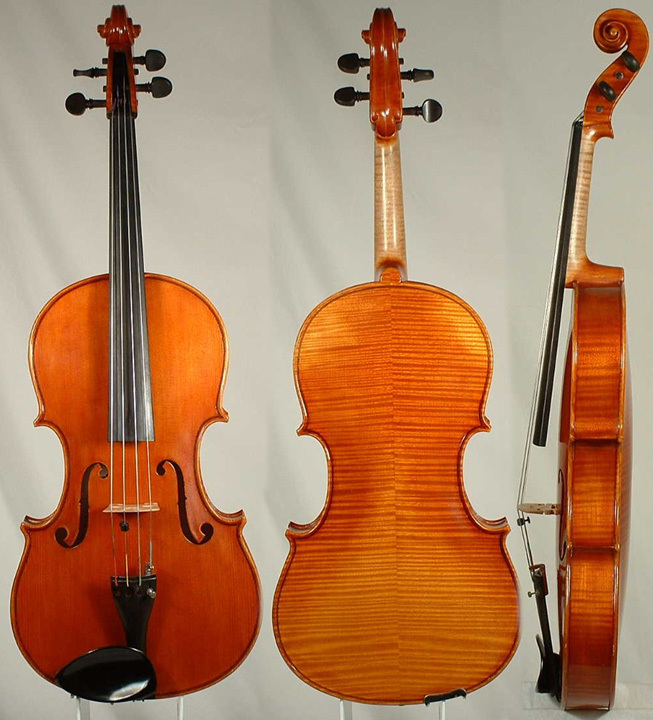 It is a Stradivarius model, golden brown, with good quality maple and spruce. The length is 42.2 centimeters. It has a pleasant medium large tone. Leo ASCHAUER. 1964 Mittenwald, Germany. 15 15/16"
Professional viola. Has a 1972 certificate from William Moennig and Son of Philadelphia. Excellent European tone woods and fine sound. Just about 16" in body length. Very fine sounding viola by this maker. Made by him in his workshop near Manchester, England. Both he and his father were respected makers. Transparent medium-dark brown oil varnish. Fine condition too. 15 1/8". John Thomas Kuczer, 1950, Winnipeg. #Ava-2621 16.5" 2001 Mint condition. Outstanding fine Viola outfit. Model 905. Antique varnish. #Ava-1866 SOLD 2002 German. New, 16", Nice Quality wood and workmanship wood, full sound. #Ava-2060 SOLD 2009. Germany. 15" Good German Viola, made of European spruce and flamed curly maple. Carefully thicknessed for fine tone by Master luthiers. Beautiful authentic antique varnish. #CRD1-509 Pietro Minotti model. 2008. Beijing. 16.5". #44 SOLD Made 2006. 15 9/16" Gasparo Da Salo model from 1580. Fine, dark and good viola tone. Nice brown oil varnish. Well-inlaid purfling design on the back in Da Salo style. Double purfling all around the edges of the top and back. Made under the supervision of Henry Riedstra.$3500. #Ava-1978 Antonius Stradivarius c.1970 Czechoslovakia.15.5"